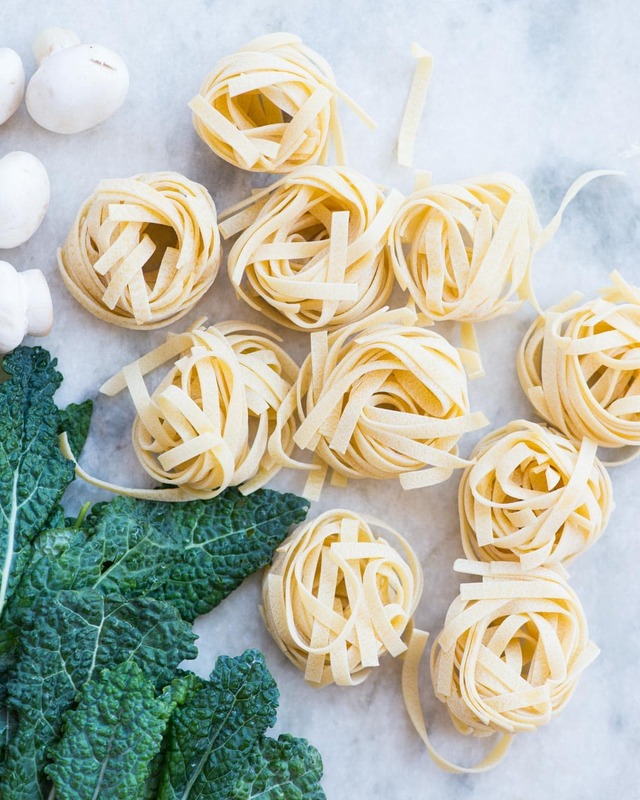 Lemon Garlic Kale Pasta. 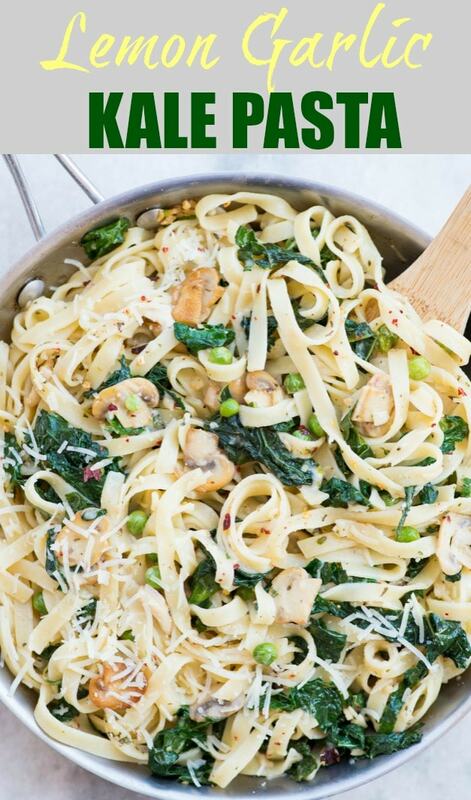 Pasta, Kale, Mushroom, peas tossed in a buttery lemon garlic sauce and topped with Parmesan. This one-pan delicious dinner is easy and quick to make. 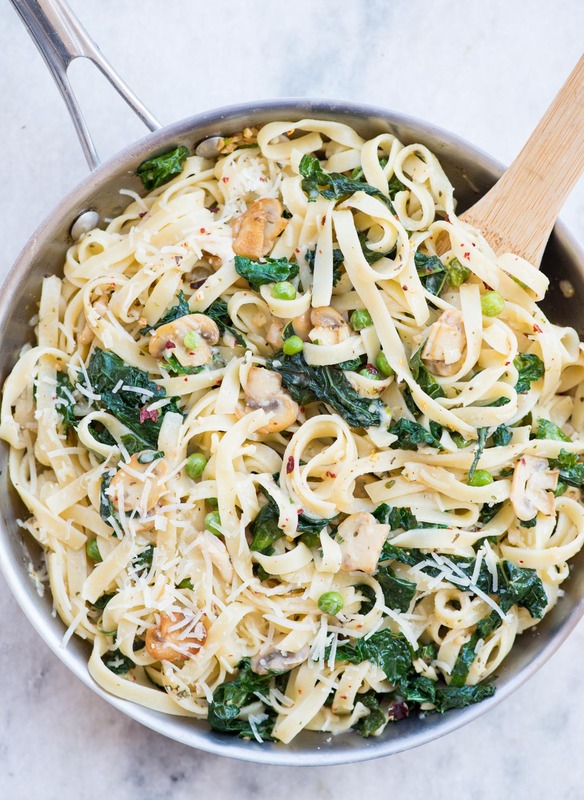 I am sure you are gonna fall in love with this Kale Pasta. The zesty butter lemon garlic sauce is refreshing and so delicious. And if you are bored if eating the superfood kale in salads, then this kale pasta is a great way to have your greens. The pasta sauce is not loaded with cream. Butter, lemon and pasta cooking water makes enough sauce to coat the pasta and the veggies. 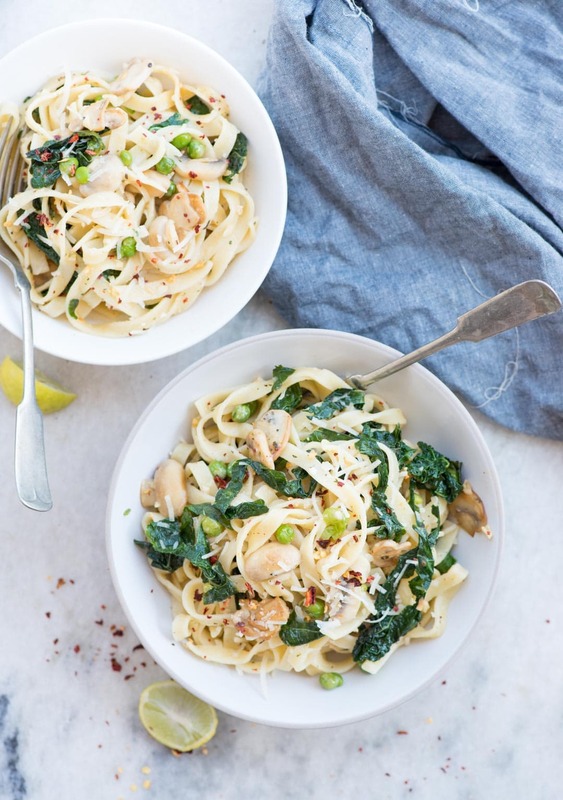 Overall this light and refreshing Kale Pasta is a winner. Starting the new year with this rather healthy Kale Pasta. I have been eating my heart out without worrying too much about calories since past few days. Cookies, cocktails, cheesy appetizers and what not. In the meantime, I was assuring myself that I going to start my healthy eating with the new year. And as promised I am back to my workout and healthy eating right after the New year. 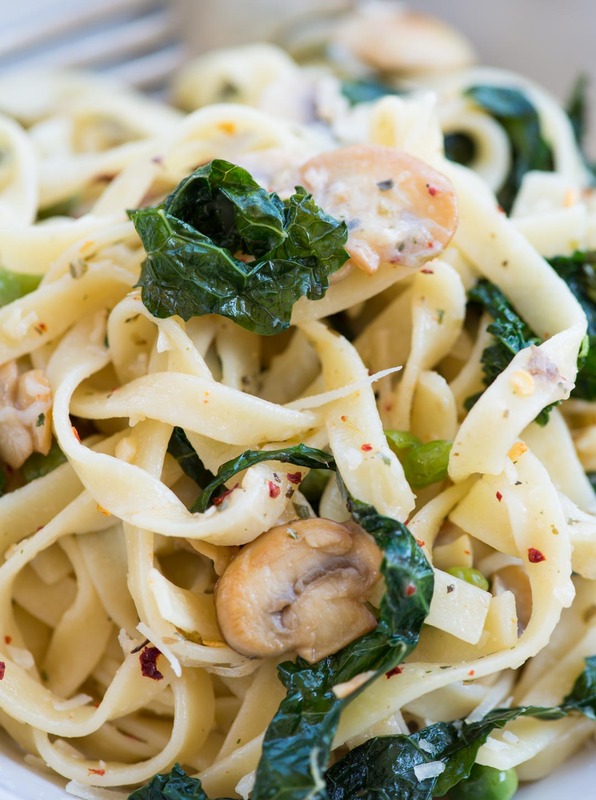 This Lemon Garlic pasta is so refreshing and will totally surprise your taste buds. I do fancy Creamy pasta, but there are days I would rather like to have light sauce pasta for a change. Pasta: Fettucine is my choice of pasta here. Because of its flat shape, it holds the sauce really well. You can use any kind of pasta you want. Make sure you cook the pasta right. While cooking salt the water generously. Reserve about 1/2 cup pasta water for later use. Vegetables: I love to keep an equal ratio of pasta: vegetable. Kale is the star ingredient here. The slightly bitter taste of kale with lemon garlic sauce is just spot on. Mushroom ads flavour and meaty texture. Delicious Sauce: The best part here is the sauce. Butter, garlic, lemon juice and pasta cooking water together form the sauce here. The sauce is thick enough to coat the pasta and veggies. Then when parmesan is stirred while pasta is still hot, that make the pasta creamy. Clean Kale under running water. Remove the stems. Chop them roughly. Sprinkle little salt. Toss well and let it rest while preparing other vegetables. Clean mushrooms and cut them into half. In a big pot bring water to a boil. Salt generously. Add the pasta and cook it al dente. While the pasta is getting cooked, In a pan heat butter and with little olive oil. When the pan is hot, add sliced mushrooms. Saute until the mushrooms have softened and start browning around the edges. Add minced garlic. Fry for 30 seconds. Stir in peas. Squeeze the chopped kale well and add to the pan. Saute until kale has wilted and the colour has changed to deep green colour. About 5-6 minutes. Add drained pasta to the pan. Add Italian seasoning, chilli flakes and 1/3 cup of reserved pasta water. Toss everything until the sauce coats the pasta and the veggies well. Take the pan off the stove. Add lemon juice, 3/4 cup grated parmesan cheese., salt and pepper. Mix everything well. Serve with more grated parmesan cheese on top. I love lemon and garlic! Goes great with pasta! I couldn’t taste the lemon so I added more, I should have saved more pasta water cause it needed more of that too! I would definitely make this again, making a sauce to go with it!